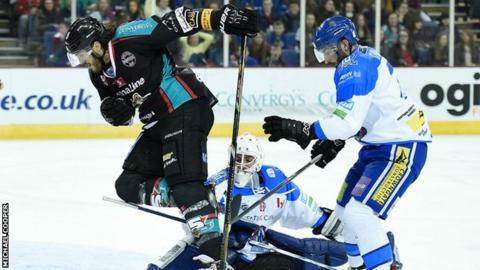 Mike Kompon's last-gasp goal helped Belfast Giants grab a 3-2 Elite League win over Coventry as the champions moved up to third in the table. Mike Egener's goal cancelled out Robby Sandrock's early strike for the Giants but Ray Sawada restored Belfast's lead before the end of the first period. After a goal-less second period, Steven Goertzen levelled on 44 minutes. Over-time looked likely as Coventry withstood Giants pressure but Kompon hit the winner with 37 seconds left. The win made it two wins in as many nights for the Giants over Blaze and was their third straight league success after last Sunday's victory over Nottingham. Sandrock scored after just one minute and 10 seconds with one of his trademark booming slapshots, immediately raising the volume in an already raucous Odyssey Arena. Colin Shields spurned a good chance to extend Belfast's lead and that miss was punished as Egener soon levelled for the visitors. The Giants dominated the remainder of the opening period, with Kevin Westgarth denied by Stewart's trailing leg and Craig Peacock by a more conventional close-range save. However, the pressure eventually told as Ray Sawada tipped in a Shields shot to restore the home side's advantage. After a dull second period, the Giants were left to rue a penalty against Daryl Lloyd for boarding as Coventry exploited the situation to equalise through Goertzen on 44 minutes. The Giants hit the post twice through Westgarth and Peacock before Compon hit his late close-range winner. Prior to last weekend's win, the Giants had suffered three straight defeats which had dropped them to fifth in the table. Belfast will be back in action away to Edinburgh on Sunday evening.